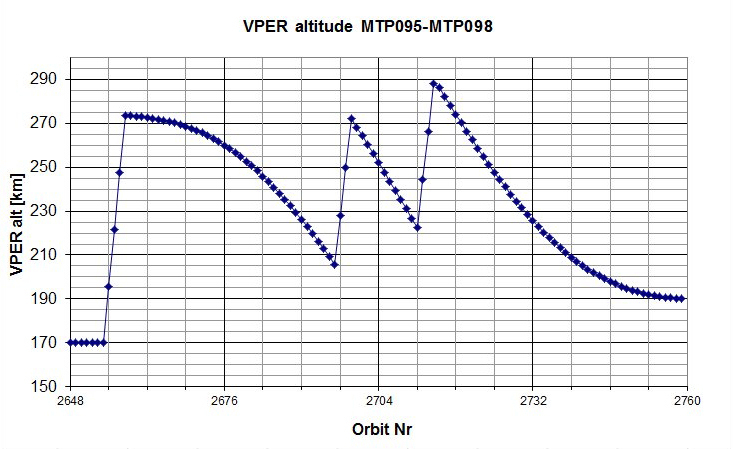 This plot shows the change in Venus Express's pericentre altitude (Y-axis) as the mission progresses, 21 July to 9 November 2013 (medium term plan (MTP) 95 through MTP 98). The X-axis shows the orbit number; each orbit lasts 24 hours. The pericentre altitude decreases due to predicted forces experienced by the spacecraft. The pericentre is raised by firing the main spacecraft engine. In this case, ten engine firings were carried out to raise the pericentre altitude.